Create Brand New Products Out Of Thin Air! Traffic Pulling "This Won't Get You Google-Slapped"
Create Multiple Versions Quickly for Optimum Ranking. This isn't the first piece of software that can turn text articles into slick videos with background music... but it is one of the quickest and easiest to use and it produces great results. This was created because I couldn't find a decent solution at a sensible price. The cheap products didn't work and the higher end products worked on a subscription so I had to keep paying to use it month after month. I got sick of it - so I did what I should have done in the first place. I got one of my own made! This software was first developed back in 2012 and was followed up by version 2. * Tube Optimizer is a Pro version feature and requires an upgrade. These videos don't have Hollywood production values but they don't need to! The idea is to rank videos that have links to your sites and offers. Links that take people to pages that earn you money (or to affiliate product links). But that's not the only use for The Big Video Machine! the dog training, stock trading and weight loss niches. 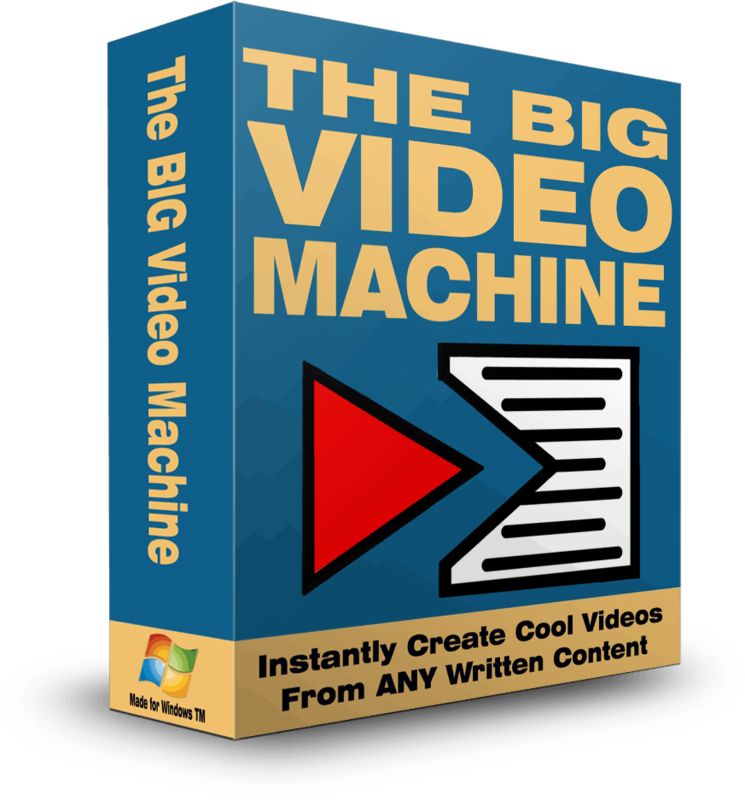 and I can make really great looking videos in just a few clicks. videos for clients and to offer for sale in PLR packs. with The Big Video Machine, to you - they are one in the same! Got written PLR that you can't pass on rights with? Turn it into video PLR in seconds and you have a unique product that you can do whatever you like with. Turn old e-courses and email sequences into video training courses! Create Affirmation Videos to sell with or without resell rights - the choice is yours! Create affiliate review videos to rank on Tube sites. Repurpose content, repurpose stuff you have private label rights to, turn written reviews with resell rights into video reviews. Use in conjunction with iCurator Pro to create rebrandable desktop membership sites that people love to buy. start cranking out killer videos right away. BOTH Resource Packs all for a one-time, low price. Guarantee and on that basis I am ordering right now! Q: Will this run on a Mac? A: This is software for Windows. It should run on a Mac using a virtual machine or similar system (VM Ware, Parallels, Crossover, etc.) But please be aware we cannot give technical support to Mac users. Q: Can I install this on more than one computer? A: You are licensed to install it on up to three computers that you own. This should cover needing it at home, work and on a laptop. You should not have it running simultaneously on those systems. If you want to be able to use it at the same time as a virtual assistant for example, you should purchase a second license. A: Yes you get all updates for the first 12 months. You also get any other minor updates outside this 12 month period at our discretion. Complete new version releases after 12 months are offered to existing customers at a special rate. Q: How long does delivery take after I purchase? A: Our delivery system is automatic and instant. Therefore you should get your access details emailed to you within a few minutes of purchase. A: In the event you need assistance simply open a ticket. We are UK based and reply to support Mon - Fri 9:30am - 4:30pm. We do check for urgent support issues (such as delivery issues) outside of these hours wherever possible. Remember, you are covered by our no questions asked 30 day money back guarantee. In the unlikely event that you are not happy with the software, just put in a support ticket and we will refund your purchase right away.